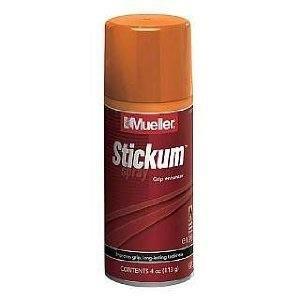 Mueller Stickum is a spray designed to be directly applied to the palms of the hands or on any surface to increase grip i.e. soles of the feet or on shoes and gloves. The spray works by forming a tacky surface on the selected area which increases grip and a resistance to sliding which can be important in gymnastics, weightlifting and numerous ball sports as well as for other health and safety measures. Only one application is required each time and if, after application, grip begins to deteriorate simply rinse hands with water to restore full stickiness.